Kurtulus served under a lot of flags. Some of these were Brasil, Italy, Russia, Greece and Syrbia. She has been used as a cargo ship in the first World War under the flag of Russia. In 1924, she had been bought by Kalkavanzade Brothers from Syrbia. She had served in Turkiye under the names Tesvikiye and Bulent. 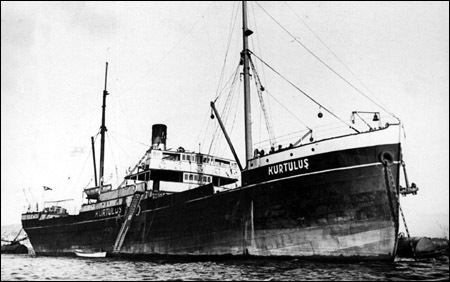 In 1934, Tavilzade Brothers Co. bought the ship and named her as Kurtulus. She had been rent to Kizilay for the carrying of food help to Greece in 1941. She had completed four journeys to Greece and been a hope for the Greece people in their worst years. She carried approximately 7000 tons of food help. The stories of the Kurtulus Steamer are still being remembered in Greece with joy. Until recent years, the sinking reason of the ship was unknown. Recent years, the researches made show that Kurtulus sunked by colliding to the rocks near Saraylar Village, Marmara Island. A powerful storm strucked her at 20th of February 1942. All of her crew, 36 people survived the accident.